Mel Gibson’s Hacksaw Ridge shines the spotlight on the story of Desmond Doss, a Seventh-day Adventist soldier who saved 75 people during the Battle of Okinawa without taking a single life. Doss might have been a household name a generation ago, but he refused many offers to record his life story. Why? Because he demanded complete and total accuracy. But his story was placed in good hands: Hacksaw Ridge joins a long list of action-driven historical movies that Gibson has acted in or directed, including Apocalypto (2006), We Were Soldiers (2002), The Patriot(2000), Braveheart (1995) and Gallipoli (1981). The Australian-born actor/director has garnered critical and commercial success as well as praise for his impressive stunts and battle sequences. Amidst this critical acclaim, however, few discussions analyze his depiction of history. Gibson’s historical dramas pose a broader question: How does a filmgoer know if a movie’s artistic license has divorced the depiction of events from reality? Filmmakers face a tricky job balancing accuracy with entertainment and profitability. Depending on the director’s approach and the degree of studio interference, the end result can be all over the place. That is why some movies do right by an era, while others miss the mark entirely. Braveheart and The Patriot, two of Gibson’s most beloved movies, serve as a perfect contrast in achieving historical authenticity. 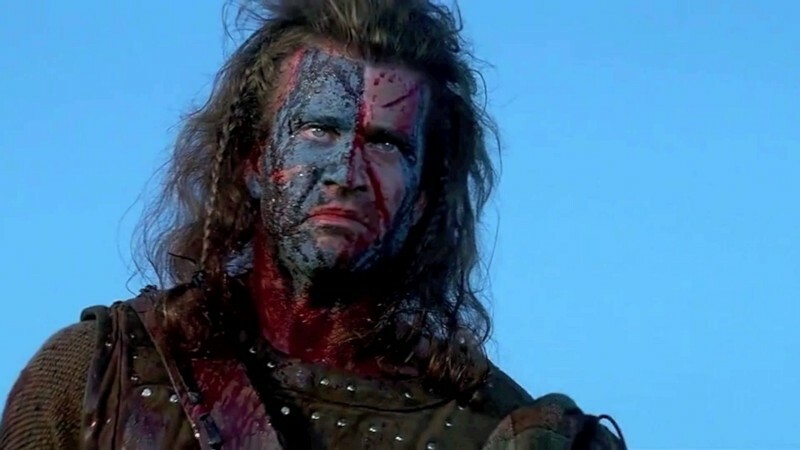 Braveheart chronicles Scotsman William Wallace’s struggle against the tyrannical rule of the English by taking a real figure and embellishing those around him for entertainment purposes. Conversely, The Patriot uses a composite character as its protagonist and places him in a world with overarching real events. Francis Marion, Thomas Sumter, and Andrew Pickens inspired his character, and Mel Gibson provides the means to translate their stories of resistance against English tyranny into a context to which contemporary Americans can relate. The picture presents its climax — the Battle of Cowpens — fairly accurately, but the film garnered its most salient criticism from its representation of Benjamin Martin’s plantation home. There, the black workers are free men and women, not slaves. This unrealistic arrangement undermines The Patriot’s other efforts to demonstrate how slavery runs against the ideals of the Revolution. While Braveheart’s monarchical intrigue does not hold as tightly to the historical narrative as the Revolutionary War in The Patriot, whiffing on slavery is an inaccuracy of importance; getting the essence of the time period right may be more important than nailing its intricacies. The ailing English king did not die as Wallace cried out “Freedom!” during his public torture, though the power of that scene is undeniable. Some historians may grumble, but cineastes and freedom-lovers will cheer. Oliver Stone, whose historical dramas are known for their bold critiques of American figures and institutional authority, has taken more criticism than perhaps anyone else for depicting history through film. 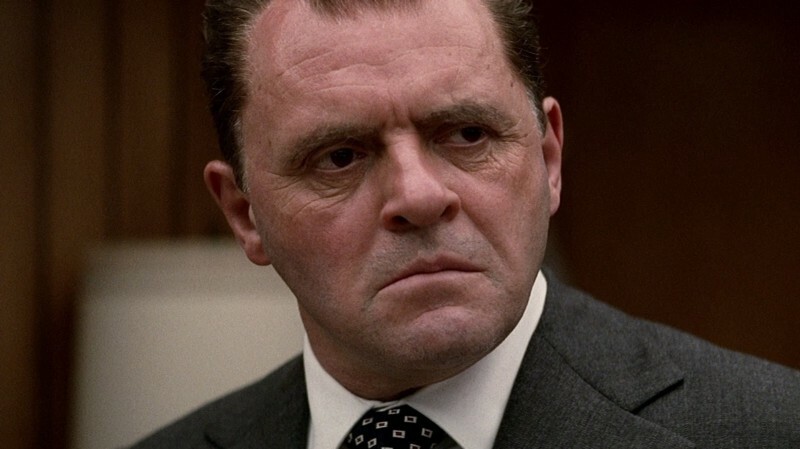 His films JFK (1991) and Nixon (1995) are known as genre classics, but they both faced intense scrutiny for inaccuracies. In JFK, Stone follows attorney Jim Garrison (Kevin Costner) who is credited with proposing an alternative to the “Magic Bullet” Theory. The filmgoer follows Garrison as he pulls apart the Warren Report, interviews various suspects surrounding the assassination, and explores unresolved questions. His conclusion? “Let justice be done though the heavens fall,” Garrison proclaims, citing one great conspiracy theory. Stone took a beating over misrepresentations of characters and details surrounding the Kennedy assassination. He responded to these criticisms by asserting that his narrative proposes a counter-myth to the prevailing myth of the Warren Commission. In the end, Stone sacrificed a certain degree of historical accuracy for real-world impact. The film even had enough traction with viewers to trigger the release of documents by the federal government related to the assassination. Likewise, Nixon apologists have blasted Stone’s biopic of the former president, which featured a flimsy theory involving Cuba and John F. Kennedy. Still, the film creates empathy — though not sympathy — for Nixon, helping audiences better understand the man’s motivations and the logic behind some of his most controversial decisions. Capturing the essence of a figure or era has often been Stone’s goal, and in this he often succeeds. Let’s pretend that W. never happened, though. In contrast, mainstream period pieces often aim less at poignant debates and more for Oscars. This makes sense, as many historical time periods provide rich slates for authentic costume design, innovative makeup, and interesting characters. Unfortunately, most efforts cash in on the “Based on a True Story” gimmick, often producing more style than substance. It seems like almost every English monarch of the last 500 years has gotten a costume drama. And why not? Cate Blanchett portrayed Queen Elizabeth in two separate films and was nominated each time, even though those movies offered little commentary on history. A recent audience favorite was the 2011 Best Picture Winner, The King’s Speech. This film does an admirable job replicating the looks and feel of the era and is anchored by brilliant acting and direction. In spite of this, The King’s Speech falls into familiar genre traps. The film builds up to King George VI’s overcoming of his speech impediment to deliver an address rallying the nation to fight against Nazi Germany, which was a rousing, inspirational finale, but it failed on one crucial front: capturing the historical truth. In reality, the man who inspired the British at each stage of WWII was Winston Churchill. Churchill’s leadership, R.A.F. pilots, fire crews, radar, American supplies, and the resolute citizenry defeated the Nazi blitz of Britain. The King had little to do with it. When you realize the fate of the Free World did not depend on a rich man’s struggle with a speech impediment, the movie’s premise falls flat on its face. Zack Snyder’s 2006 flick, 300, is an entertaining comic book adaptation but a blatant example of bad history. This popular take on the Battle of Thermopylae actually goes out of its way to break with the archeological and textual record to depict Persians and other Middle Eastern and Asian characters as servile, decadent, brutish, and inhuman. 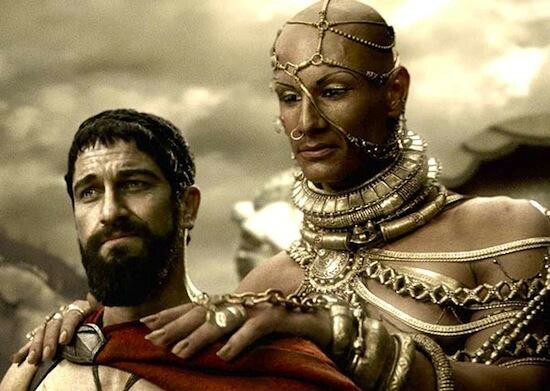 Emperor Xerxes in the film looks nothing like he does in ancient busts. The villainous elite Persian troops in the movie end up looking like soulless ninjas with hidden faces. One need not travel to the ruins of Persepolis to see them as regular human beings: a Google Image search for ancient Persian art does the trick. Those familiar with the time period may recognize the inaccurate fighting techniques and equipment, but it doesn’t take an expert to detect that half of300 is filled with racist undertones. The movie refers to the villains as Persians, but they are painted in hateful Muslim stereotypes that Westerners would fear. For the record, this took place a millennium before Muhammad, so fiction or not, this was harmful and misleading. No one who saw 300 was expecting a history lesson, but the film’s lack of authenticity is regrettable. Movies like Gettysburg and Gods and Generals, both Civil War dramas produced by Ted Turner, get stellar marks for historical accuracy. Each film not only nails the look and feel, but also humanizes figures — Robert E. Lee, Colonel Joshua Chamberlain, Thomas “Stonewall” Jackson — who tend to be portrayed as one-dimensional heroes or villains. Gods and Generalschronicles the first two years of the Civil War, and Gettysburg hones in on the bloodiest battle in U.S. history. Each movie succeeds in illustrating the human drama of these pivotal events through the eyes of the people who fought it, though this approach was not without its pitfalls. Gettysburg skillfully builds empathy for both blue and gray, but reserves the most sympathy for the Northern cause; Gods and Generals mistakenly gives too much voice to Confederate figures who, however they wanted to rationalize it, were fighting to ensure the survival of slavery. As such, the film moves well beyond establishing empathy as Stone does with Nixon and glamorizes or overlooks the culture of slavery. The result? Gods and Generalswas panned by critics and the historical community alike while being quite popular with a fringe community: Neo-Confederates. Considering “do’s and don’ts” for history in movies, we should remember that even Shakespeare played with history. The genius of his historical plays is that they hold true to timeless truths; Orson Welles could not have setJulius Caesar in Mussolini’s Italy if the original play had not thoughtfully spoken about how ambition, idealism, loyalty, and fear impact history. If the reason we examine the past is to reveal something about the present, then artists must bring to life enduring themes. For those heading into the theater for Hacksaw Ridge or just studying the past, bear these thoughts in mind.